IBM® System Storage™ DS8000® Copy Services provide functions for Disaster Recovery and Business Continuity solutions for an IBM i server. Many IBM i customers with natively connected DS8000 use Metro Mirror or Global Mirror functions to provide a set of consistent data at the remote site. This approach allows fail over or restoring data in case of disaster at the production site. You may also use IBM FlashCopy® technology to provide point-in-time copy of disk, from which you can back up data to minimize the necessary downtime. This IBM Redpaper™ publication is intended for those who want to plan or implement DS8000 Copy Services with IBM i. 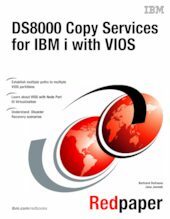 It discusses the use of DS8000 Copy Services for an IBM i system connected with VIOS Node Port ID Virtualization (NPIV). For this paper, we created test scenarios with FlashCopy, Metro Mirror, and Global Mirror of Sysbas. We used DS8000 DS command-line interface (DS CLI) commands to manage the scenarios.